Next, friends, I loved Bloody Rose even more than Kings of the Wyld! This book feels like stepping into a fresh Dungeons and Dragons campaign, where you get to play as a Lesbian bard who is allowed the honor of going on a few quests and ultimately telling the story of the most famous mercenary this side of the Heartwyld. And, I’m not sure I’ve ever wanted to play (or be) a character so much in my entire life. Nicholas Eames truly has created something so unique with his books, because in this world bands of mercenaries join up to go on tours, to perform shows, in which they will slay the biggest and baddest monsters around. And sometimes, if the band is good enough, they will take on other contracts to help protect their five major cities and make some really good cash (and accumulate a lot of fame) along the way. Bloody Rose is a brand new book, with brand new adventures. 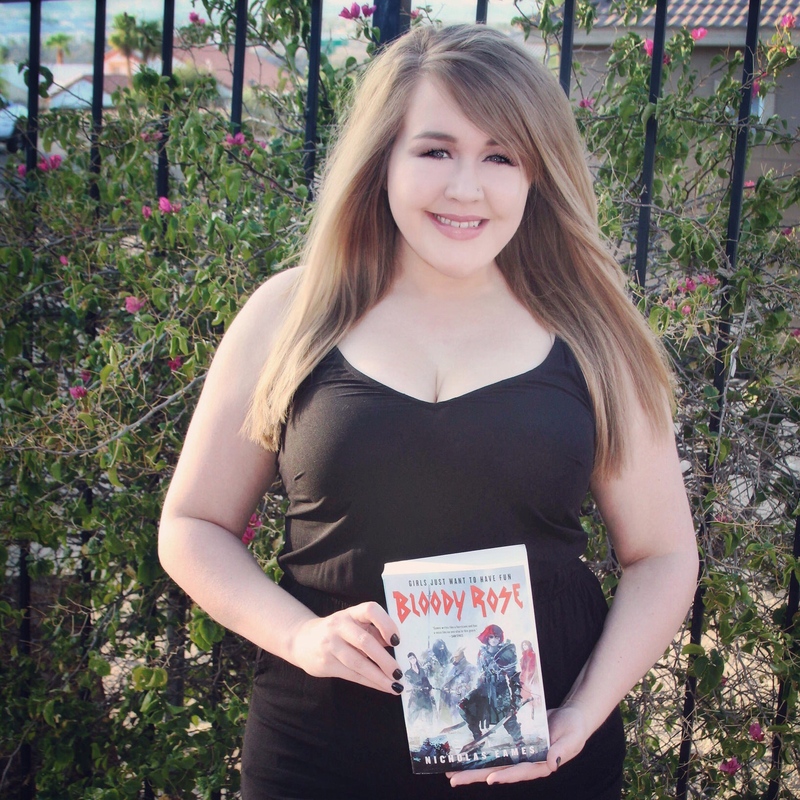 And even though this title and book cover may star Golden Gabe’s daughter that he got his band, Saga, back together to rescue in Kings of the Wyld, this book follows a brand new mercenary band, six years later. ➽ Tam – Seventeen-year-old girl who has lived a sheltered life with her father, ever since her mother died while being a mercenary. She does work at the local tavern (which also has a six armed arachrian manning the bar, and warming my heart), where her uncle and a few friends have taught her a few things behind her father’s back. Tam is also a lesbian, and her world completely changes when she finds out that Fable is in dire need of a new bard. ➽ Rose – Frontwoman of the band Fable, Golden Gabe’s daughter, and a reputation that has already guaranteed that she will go down in history as one of the bravest mercenaries to have ever lived. Also, she duel wields scimitars – Thistle and Thorn! ➽ Freecloud – the last Druin and Rose’s lover, who was on the battlefield of Castia with her. And has a pretty impressive sword named Madrigal! ➽ Brune – Vargyr / Shaman! Wields Ktulu, that can separate into two weapons, kind of like Varian Wrynn’s (my favorite character) in World of Warcraft. I didn’t ask for these tears. Speaking of World of Warcraft, I have an extra soft spot for shamans, and Brune even shifts into what my shaman shifts into, so my heart is so very happy. ➽ Cura – Inkwitch / Summoner, and my favorite character in the entire book. Cura’s sexuality is never completely stated, but she does like girls (I’m secretly hoping, wishing, and thinking that she’s pan)! 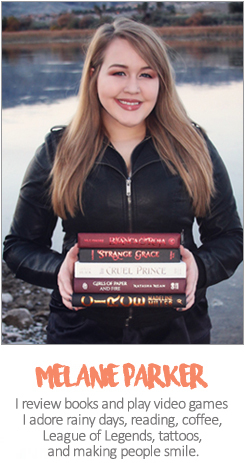 She wields a trio of knives, but her powers are so much more than that. Also, I love playing summoners in D&D! On top of Cura’s amazing personality and banter? I seriously have the biggest crush on this fictional character. ➽ Roderick – Fable’s booker and handler of their contracts! Also, he is a Satyr and is forced to keep it hidden. There is such a wonderful discussion around this character and what makes a monster and makes someone lesser than someone else based on the deeds of others. I easily fell in love with Roderick and his little hat. I really hope we get to see more of him in book three. We get to see each of these characters deal with many things from their pasts that are ultimately holding them back. But all the story and character arcs are seamlessly woven together, and this gang of misfits truly come together to create something more beautiful than I have words for. And Bloody Rose and her crew have one last gig before their tour is over, even though they plan on completing one little contract afterwards. And they need someone to tell their story, so they ask Tam to come along. I mean, what’s the worst that could happen? It’s not like life as they know it is going to end because there is a crazed necromancer out there, right? Obviously wrong. There is a Winter Queen on the loose that wants to completely destroy this world and everyone residing in it, because she is forced to live in a world without the thing she loves most. I feel like this book also heavily talks about motherhood and all the beautiful, but messy, aspects that come along with that title. How parenthood will always be the most difficult but rewarding job title a person can carry. And even though I think this book is one adventure after adventure, leading up to the most epic battle, I truly think that the heart of this book is about motherhood. Tam and Cura are both grieving the loss of theirs. Rose is struggling to be one. And the Winter Queen is showing no mercy for the people who took hers away. I know this is a fun and humorous book, and I love it for that, but Bloody Rose packs a very powerful punch. I cried during the entire epilogue. I also think there is an important discussion to be had about how even though being a parent is one of the most important things in this world, it’s also not the only thing a human will ever be in their life. And there are so many ways to love, and to teach, and to heal, and to just live the life you want to live as a person and as a parent. I’m not a parent yet, so take these entire paragraphs with a grain of salt, but I think this book really talks about balancing being a parent and being whatever you want to also be and how they can cohesively come together to allow you to live a life you are both proud of and a life that you feel is worth living. Bloody Rose is also a love letter to found families everywhere. Again, parenthood is for sure a major theme, but this book truly embraces the “it takes a village to raise a child” proverb. All the members of Fable were forced to grow up seeing their parents go to battle in very different ways. Some got by on the love from their secondary family members, and others only found their true family when joining Fable. Regardless, this book really helps prove that blood will only ever just be blood. And that a family is what you choose and who will always choose to unconditionally love you. And the writing? Seriously, I almost want to believe that Nick is a bard himself. I say this in a lot of my review, but lyrical writing is my favorite extra element in books, and his prose is so unbelievably beautiful. And he truly has mastered how to string words and sentences together. I feel like I highlighted at least a third of this book. I also feel like this book is told in such a unique way, because even though I would, without question, say that Tam is the main character, I would still say that the star of this book is Bloody Rose. And I think that Nick played with the concept of what a bard is so impressively, and it truly made for such a unique reading experience. Also, the epilogue was 11/10 and truly tied everything together so perfectly. Overall, this is epic fantasy as its finest, and this will for sure make my “best of 2018” list come December. What Nick has created with this world and story is just such a breath of fresh air in adult fantasy. It’s smart and witty and will leave your sides hurting from laughing. But the messages are powerful and important and will leave you reflecting the parallels in our world in 2018. I love these books, I love these characters, and I never want Nick to stop writing them. I hope you all pick this up upon release next week, and I hope you all strive to live a life that you would be proud to have a song written about. Content and trigger warnings for grief depiction, abandonment, loss of a loved one, animal deaths, death, murder, violence, drug addiction, emotionally abusive parenting, depiction of self-harm, talk of past self-harm, talk of past suicide attempts, talk of past sexual abuse, talk of slavery, and war themes. Really need to check out this series. Great review. This was quite the love letter to a book, Mel! I’m going to have to check out this series. Wow. 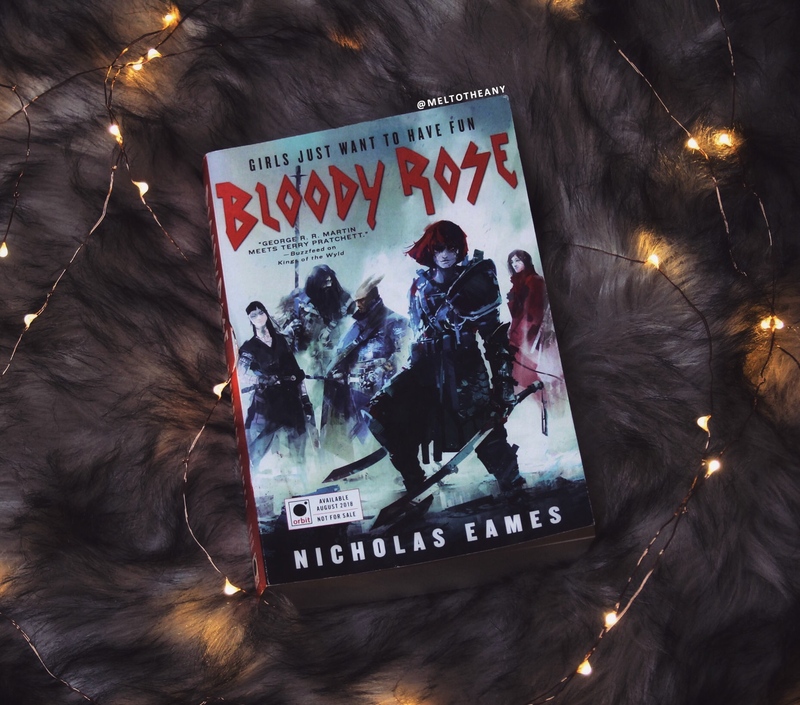 I’m just finishing Kings of the Wyld, which I’m enjoying a lot, and I cannot wait to start reading Bloody Rose.